João Batista Sergio Murad, otherwise known as Beto Carrero, was a Brazilian entertainer and entrepreneur who had a number of different jobs before deciding to develop what has become the largest theme park in Brazil, as well as one of the largest in Latin America. Beto Carrero World is widely spaced out, and the standard of theming does vary in places, but the areas that have had investment really look the part. The entrance gate (pictured across) is certainly one of the more distinctive I've come across, even if it does rather suggest an artist under the influence of a controlled substance! The weather for our visit was perfect, with a clear blue sky and an outside temperature of around 30°C. The downside of this, however, was a massive number of guests in the park. We had to wait around fifteen minutes to purchase tickets, and quite a few of the rides in the park had wait times exceeding one hour. It is worth noting that the wait times were for the most part due to guest numbers rather than operations; the major roller coasters were running two trains, and while they were stacking, the efficiency was probably better than any other park I've seen in South America. One of the perils of being a coaster counter is kiddie coasters that operate far too many circuits. I'm pleased to report that the appropriately named Dum-Dum (#1885) was being run in an enthusiast-friendly fashion, as each train load of passengers were sent around the course for a single circuit only. Better yet, the pacing on the ride was relaxed, resulting in no jarring whatsoever. 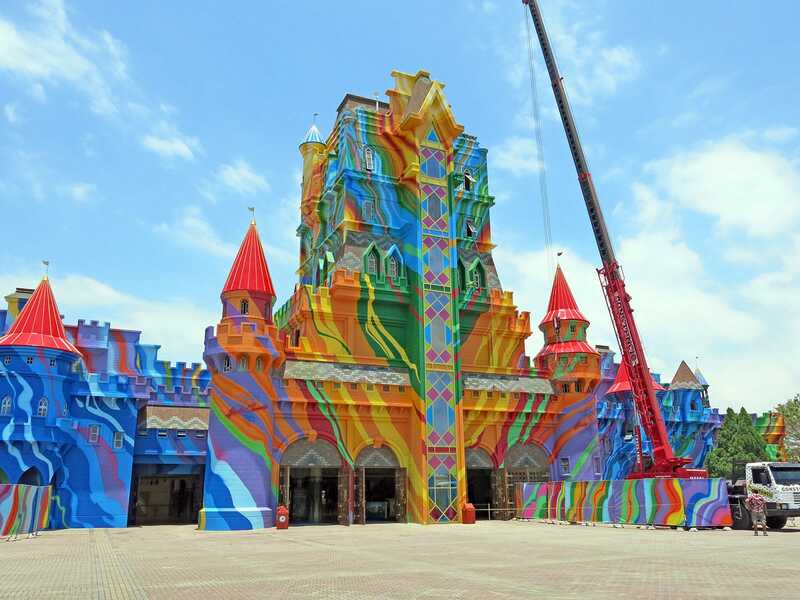 Tigor Mountain (#1886) was scarcely more exciting, mostly because it was very short, having been originally constructed for an indoor family entertainment centre in São Paulo. The real surprise for me was Star Mountain (#1887), which I'd fully expected to hurt, given that every other Vekoma Corkscrew with Bayerncurve I've ridden has. Instead, I was able to enjoy a smooth ride with barely any jarring at all. The ride broke down while we were waiting for it, but a large number of people left the queue meaning that our overall wait time was about what it would have been without the pause in operations. The largest coaster in the park is Firewhip (#1888), a second hand Vekoma SLC that operated for twelve years at Suzuka Circuit in Japan. The ride was refurbished and repainted during its move, and now features an elaborate gradient and flame effect on every support that looks excellent. This, coupled with elaborate landscaping, makes it the best looking SLC I've seen in my travels. Better yet, it actually rides reasonably well too; while there were a few "ouch" moments, there were nothing like as many found on the two prototypes. Our planned itinerary had a seven hour drive after Beto Carrero World, so in the interests of sanity we set off just after lunch time. 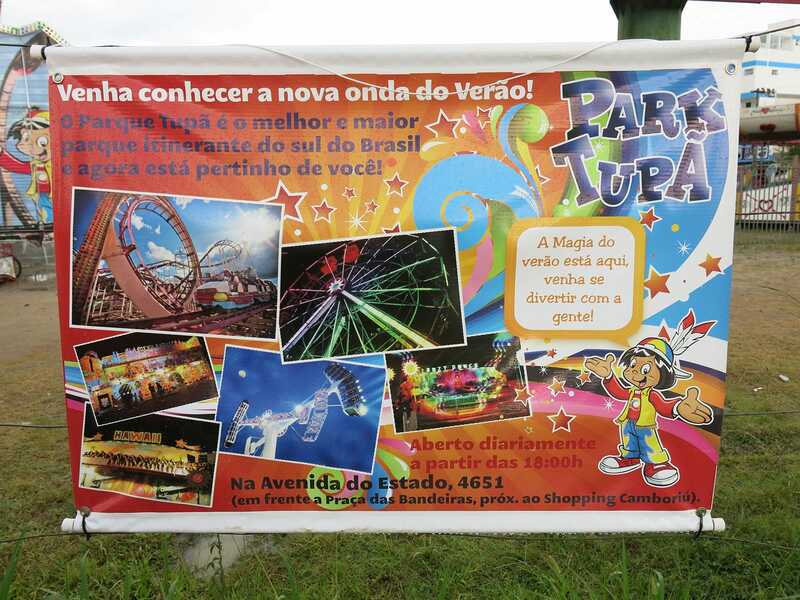 We had been driving about twenty minutes when we accidentally discovered a travelling fair with a roller coaster in the town of Balneário Camboriú. The problem was that it wasn't due to open until evening. None of us was particularly enthusiastic at the prospect of arriving into our hotel after midnight, but after some discussion, we realised that we could move our hotel at no cost while also reducing our overall driving distance. As such, we had a relaxed afternoon which concluded with us riding the Roller Coaster (#1889), our third Pinfari ZL42 in less than a week.